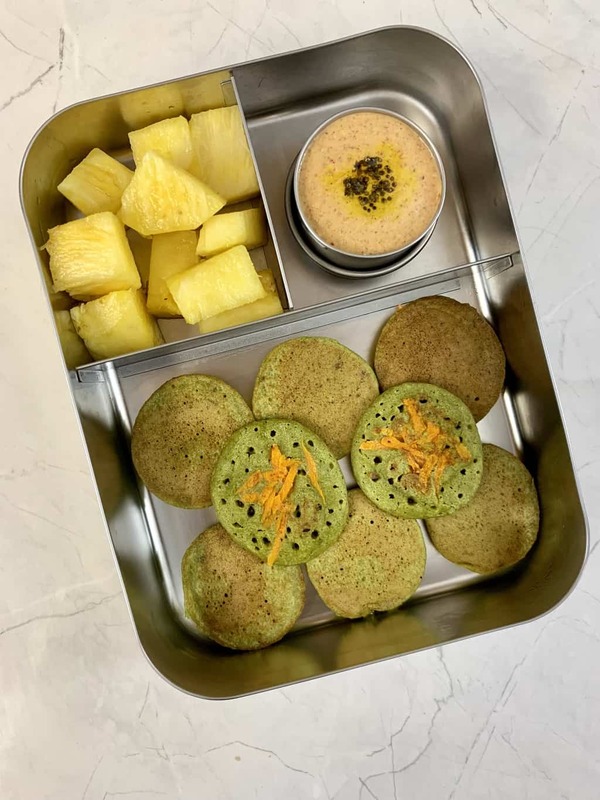 Today’s lunch box is a very healthy variety made with pureed spinach, this protein rich preparation is the best thing to have in breakfast ,lunch or dinner. Light and tasty, this spinach coin dosa is the best way to sneak greens in your food.I usually pack this lunch box when i have leftover dosa batter.Have also included protein rich peanut chutney which goes well with this dosa. 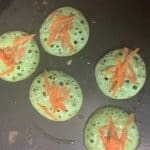 LUNCH – Spinach Coin Dosa – This is a healthy ,delicious and simple way to make your kids eat veggies and greens.Coin Dosa are bite sized dosa and easy for your kids to eat and mess free. 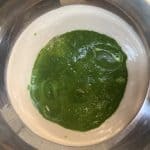 Take 2.5 cups of spinach (palak) and blend in a mixer grinder with 2 tbsp of water to make a fine paste and keep aside. Add the ground paste to 1 cup of of dosa batter and mix well.Adjust salt at this stage. 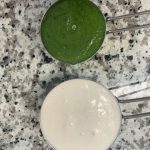 Make sure the spinach paste is well incorporated.Make sure batter should be thick flowing consistency and not running. Now heat the tawa or the griddle and drop about 1 tbsp of dosa batter each on the tawa to make coin sized dosa’s. Also add shredded carrot at this stage as seen in the pic.I usually prepare 5 to 6 at a time. Add few drops of oil from the sides and in the center as well and let it cook for the minute. Then flip the dosa and allow it cook for a 1 minute or so. That’s it. Now remove the dosas and similarly prepare the coin dosa with the remaining batter. In this recipe i dint blanch the spinach/palak but you can do it as well. 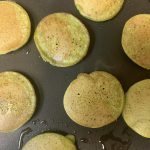 Make sure your dosa batter should be little thick ,after adding spinach puree it may become more watery in consistency. Make sure the dosa batter is not cold. I use ghee instead of oil for kids lunch box. You can also add 1 green chilli and 1 tbsp of coriander leaves while grinding spinach to give more flavor. Instead of coin dosa, you can prepare regular dosa with this batter or uttapam with this batter as well.Note this batter can be used to make idly’s as well. SNACK – Pineapple I cut pineapple in to cubes and packed into the box. Dry Roast Peanuts previous evening and store it. Chop the pineapple into medium sized chunks and refrigerate.